Kyodo has an extensive news-gathering network employing more than 1,000 journalists and operating a worldwide communications system. Member newspapers, radio-TV stations and other subscribers receive an important part of their news from Kyodo. Half of the reporters are posted in Tokyo while some 70 correspondents are stationed in 43 major cities throughout the world. Around the clock, more than 28,000 lines are moved each day, covering international and domestic politics, business and markets, finance, law and crimes, disasters and accidents, science and technology, art and culture as well as sports and human-interest stories. Kyodo's in-depth reports on Tokyo markets, which open earlier than any other key world market, have consistently proven their worth. Kyodo's Japanese-language service is distributed to more than 70 newspapers published by its 56 members and about 120 radio-TV stations throughout Japan. 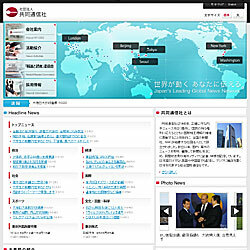 Kyodo's Japanese- and English-language news services reach Japanese diplomatic establishments overseas via the Internet on a real-time basis.